All our bathrooms are installed by expert plumbers and experienced tilers. If you require a complete refubishment, we can of course help with design advice and give a quote on your new bathroom remodel. 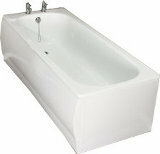 Bathroom suites start from £620 excl. VAT supplied and installed, this price does not include tiling or a shower. The basic suite below includes a bath, panel, basin, toilet, cistern and taps. Additionally can also quote for a new shower unit or wall mounted shower, tiles and floor tiles, the complete package. Of course if you don't want one of these packages we will quote for your own ideas and choices. We know how important a bathroom is, a place to relax and enjoy. Ideal for a quick modernisation. Suite comes with syphon, plug and chain, chrome, basin, waste, combined bath waste and overflow. From only £620 supplied and fitted. Suite comes with toilet, white seat, bath and basin with pillar taps, plug and chain waste. From only £983 supplied and fitted. Optional choices, upgrades available, contact us for a quote.